Viva Boyer was born in Bulgaria. 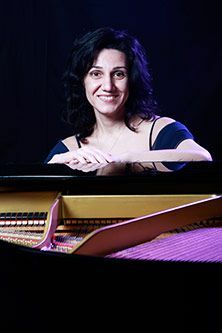 After graduating from the National Music High School with Honours and Gold Medal, Viva continued her piano studies with many distinguished musicians at the Bulgarian State Academy of Music, where she obtained her BA with Distinction. After winning several competitions, she worked in the Academy as a pianist and piano teacher. Viva has given a series of acclaimed recitals and chamber music concerts and has made numerous recordings and broadcast programmes for Bulgarian National Television and Radio. Since 2001, Viva has lived in London where she has many pupils and performs regularly in public. Currently Viva is studying for an MA in Music Performance at City University London and is the winner of 2012-2013 Mercer's Prize.